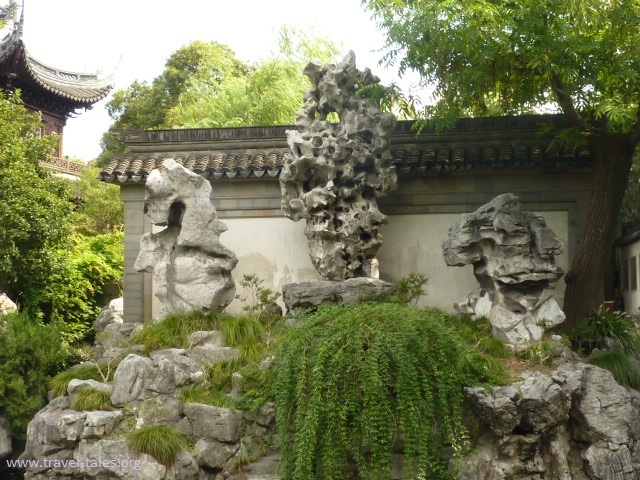 Yuyuan Garden in Shanghai occupies an area of 20,000 square meters (about five acres). However, the small size is not a representative of the attractions of the garden. The pavilions, halls, rockeries, ponds and cloisters all have unique characteristics. There are six main scenic areas here: Sansui Hall, Wanhua Chamber, Dianchun Hall, Huijing Hall, Yuhua Hall and the Inner Garden. Each area features several scenic spots within its borders. The true treasure of Yuyuan is the Exquisite Jade Rock. Located across from Yuhua Hall, it is one of the three famous rocks in the southern region of the Yangtze River. (The other two are Duanyun Feng in Suzhou and Zhouyun Feng in Hangzhou.) The rock is 3.3 meters high and has 72 holes. What is interesting about this rock is that if you burn a joss stick just below the rock the smoke will magically float out from all of the holes. Similarly, when you pour water into the rock from the top, the water will flow out from each hole creating a spectacular sight to see. Pan Yunduan was very fond of the Exquisite Jade Rock, and he built Yuhua Hall facing the rock so it was convenient to sit in the hall and admire it. The furnishings in the hall were made of top grade rosewood of the Ming Dynasty, appearing both natural and graceful. In her journal my mother told some of the history tales of the buildings but didn’t comment on their architecture. The pictures she took suggest she looked up and down at them as much as at the greenery in the garden.